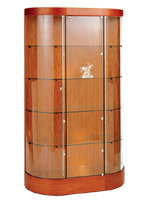 These curved front California display cabinets are a design choice that will get the attention of the public. These cases have an elegant curved design while still fitting against any wall. How rugged are these glass curio cabinets? Each model is made of durable laminated MDF with tempered glass exteriors and shelves. The display cabinets also come with locking doors to keep collectibles safe. 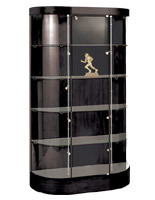 Trophy display cases, such as these wall curio cabinets, serve a variety of purposes. Schools, businesses, libraries, and museums use trophy display cases in their exhibitions. These display cabinets can hold jewelry, artifacts, antiques, photographs, trophies, and other valued items. Browse curved front display cases in black finished wood, maple finished wood, cherry finished wood, and silver polished metal finishes. These display cabinets have three halogen top lights in the canopy and the option of side track lighting. Wall display cases have locking tempered glass doors and mirrored glass decks on the interior. These glass curio cabinets are equipped with wheels for easy maneuvering. Arrange your showcase collectibles anyplace on the five display settings with pride. Trophy display cases like these are great for any environment. What can you expect from these curio cabinets? Oval shape gives three angled vision of your trophy showcase for your audience. A longstanding base and canopy guaranteed for long lasting use. Tempered glass exterior and shelves. What options do these display cases have? Four different finishes to specifically fit showcase objects with your wall environment. Side track lighting systems are accessible with each wall showcase. Wheels make these glass trophy cabinets maneuverable for fast wall exhibition changes. Four tempered glass shelves adjust to your showcase objects. These display cases are ideal for both public and private settings. In stores, museums, schools and offices, locking cabinets are great for guarding items like merchandise, artifacts, trophies and product samples. In the home, they can give peace of mind to users by protecting treasured family heirlooms and other keepsakes. Their strong tempered glass exterior and shelves are stronger than normal glass and if broken, will form smaller, more manageable chunks, rather than jagged shards. This is why the material is often referred to as a "safety glass". To keep merchandise and curios safe, buy a case on DisplayCabinets2go.com and get wholesale pricing!